My husband and I have a few movie lines that we quote to one another in various situations. Lately it's been "get out, get out now" which shows up a lot in both movies and TV shows. Usually our hero is inside looking for evidence and their side kick is outside watching for the evil perpetrator to arrive. 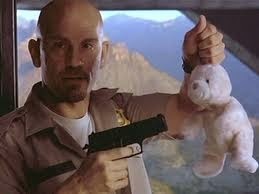 Before that it was “Put the bunny down” made famous (to us) in a Nicolas Cage movie, Con Air. You can read more here about bad Nic Cage movies. I'd like to modify that quote for knitters “Put the pattern down”. My newest class is called What the Pattern Doesn't Tell You. It's a collection of information and techniques which come directly from the many questions I'm asked by knitters. Many highly skilled knitters only learn different techniques when we designers force them to by including them in our patterns. One of my students has named two of my very simple techniques as "worth the cost of the class". Both are tips that don't belong in a pattern. Blog postings here and here. “Put the pattern down”, pick up a reference book, and try some new techniques on swatches to improve your skills and give yourself new options to create even better results. Many sources will give you many new things to try. We knitters create fabric in very different ways. Results between knitters vary. To quote the conspiracy movies, when it comes to finding your best techniques "trust no one", knit a swatch and test it out for yourself to see how techniques work with your knitting style and for specific projects. Should you Take a Private Knitting Class?